A carefully tended Matsuzaka cow being hand-fed beer. Photo Courtesy of Matsusaka City Tourist Information Center. Raising cattle for beef has become a significant part of Japanese agriculture since the 1960s. Most Japanese beef cattle are not raised on large ranches and do not graze in pastures or open grasslands. Instead, they are raised in small pens and individual stalls, and fed a diet of grain. In 2001, there were 110,000 households raising 2,806,000 head of beef cattle in Japan. As with other crops, producing cattle for beef has shifted toward larger commercial operations and small farmers no longer raise a few beef cattle on the side. Matsuzaka, in Mie, is Japan’s most famous beef-raising area. It produces the heavily fat-marbled beef that Japanese consumers prefer. Matsuzaka cattle are raised in small stalls where they lead a pampered life. 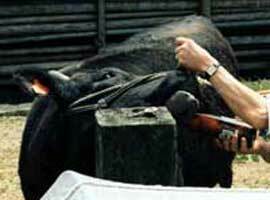 They are fed grain and beer, and their bodies are massaged every day to produce the desired texture in the meat. Matsuzaka beef is very expensive. Click on CHARTS, below, to learn more about beef cattle in Japan.